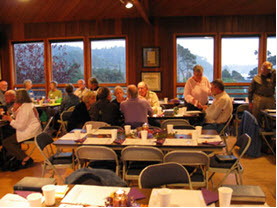 For information about weddings at the Mendocino Presbyterian Church, please contact the church office. 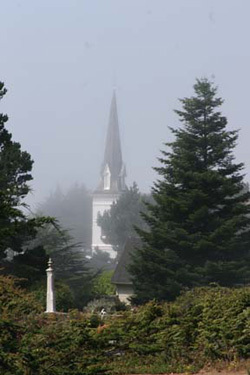 Each wedding ceremony held at the Mendocino Presbyterian church is performed with respect to our commitment to Jesus Christ. In a service of Christian marriage a lifelong commitment is made, publicly witnessed and acknowledged by the community of faith. 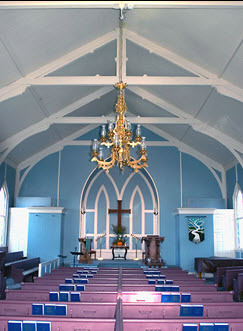 At Mendocino Presbyterian Church (MPC) it is our desire to have each moment of your wedding ceremony reflect that commitment and to be a meaningful and memorable occasion. As a way of achieving that end we offer the following guidelines and regulations to ensure that nothing will detract from the joy and solemnity of this occasion. Our Sanctuary has two aisles, which are 4 feet wide and 53 feet long. The seating capacity is 200. In addition, we have a balcony with the maximum capacity of 10 people. Or Sanctuary is a place of beauty and dignity. No pets, with the exception of service animals, are permitted in the sanctuary at any time. Appropriate behavior is required of all guests and members of the wedding party at all times when on the church campus. No smoking or alcohol is permitted on the church property. Preston Hall, across the church courtyard, can be booked for receptions.